Sometimes I really don’t have that much to say here. I know most webcartoonist don’t make long comments belove the strips like I do, but I’ve been doing it from the start so I can’t quit now. So I’m just gonna waste your time, and let you read this crap, here, now. This entry was posted on Friday, June 19th, 2009 at 6:00 am and is filed under Comic. You can follow any responses to this entry through the RSS 2.0 feed. Both comments and pings are currently closed. Forget XP, give the poor guy Windows 7. Pfft. You don’t use Ubuntu because you’re not awesome. Speaking of Windows 7, I’d really like to get my hands on that and try it. I actually know nothing about it. 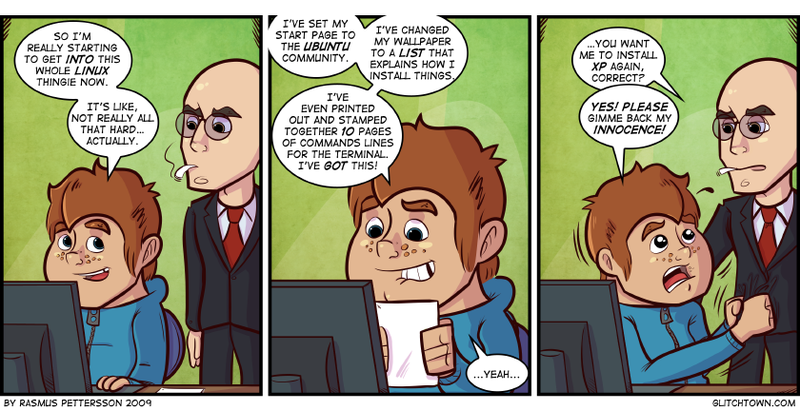 Hopefully it’s a lulzy OS that I can make strips about. Chris: Ubuntu is great indeed. I have no use for it though. Bashing? Who? Me? 😀 I have no idea what you’re talking about. but I love anything that bashes Ubuntu. Haha! And I love to bash all OS’ equally. I try not to take sides. Should throw one at Solaris.